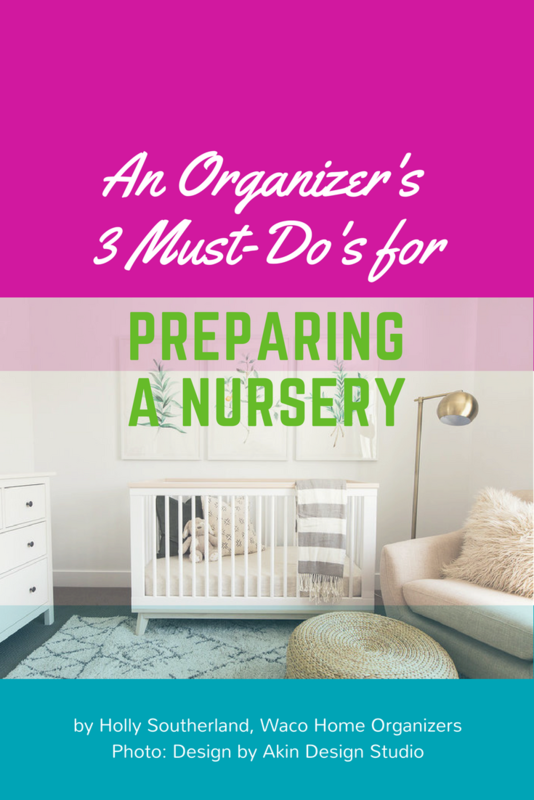 We asked our favorite organizer extraordinaire, Holly Southerland from Waco Home Organizers, for some tips on preparing a nursery. And y'all, she didn't disappoint. Determine placement for the big pieces first. The room you are using for your nursery may be a room that was previously a guest room, craft room, or home office. As you are re-thinking the configuration, even if you intend to continue using the room for a couple of purposes, start with a clean slate. When we work with clients to organize, we often take everything out of a space first. It gets you out of your rut with thinking that just because the twin bed has always been on that wall, that it always needs to stay there. Then we strategically determine where the big pieces will go first. In a nursery this will usually be the crib, changing station, and rocking chair. Crib: When determining crib placement, the easiest way to decide is to look at the wall space you have available. Unless you have blackout curtains, you may not want to put the crib in front of a window. Determine first where you’ll place the crib and then where you’ll put the chair and changing station. Rocking Chair: Think about placing the chair where there is an outlet nearby in order to put a lamp and sound machine within reach of the outlet. Changing Station: Consider placing the changing station near the door, as you’ll be often coming in and out for this task. Keep the trash can or Diaper Genie near the door so when it’s time to clean up, you save steps and can just reach in and grab it quickly, even if baby is napping! 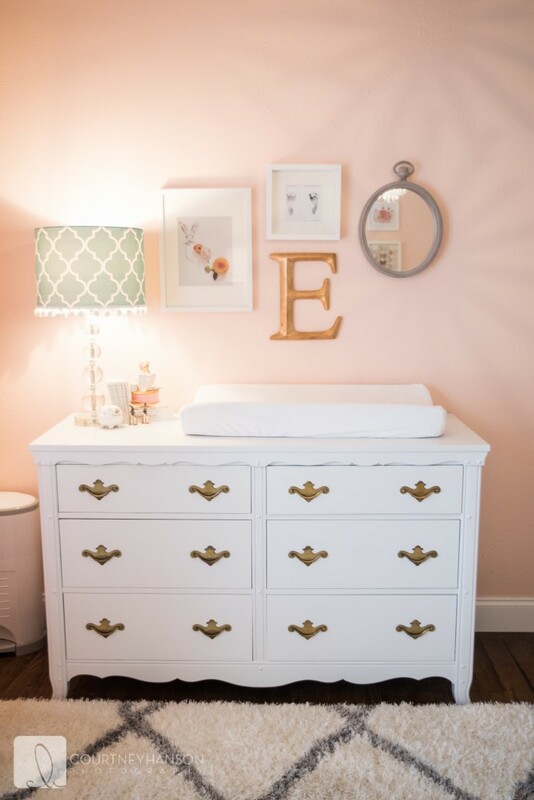 Consider also to use a waist-high dresser rather than buying a changing table, and using a pad on top that can easily transition as your baby grows up. You can use the top drawer to store diapers, wipes, and cream to keep it out of sight. Places in Waco you can find dressers like this are Junque in the Trunk, Junk Queens, and my friend Tammy Andrews who started the Waco’s Best Vintage Facebook Group. Create stations and kits for easy use. Mamas who we help organize LOVE the ideas of stations and kits for diaper changing, bottle making, and more. Have these stations in high traffic areas where you often hang out. It may take a little rearranging on the front end, but you’ll be glad you took the time to do it because it will increase the efficiency of your day to not have to take 10 extra steps every time you need to change a diaper. Keep one diaper changing kit in the living room, one in the car, and one in the nursery. You may consider keeping them in a cute basket or a rolling cart in the living room. The IKEA Raskog cart is versatile, and Target also has a 3-tier cart for less than $30 that you can use some of your gift registry cards to buy. Even after your baby is out of diapers, you can use a cart like this for a baking station in the pantry to easily roll out, or a station for toys in the playroom that can be moved from room to room if your kids don’t like to be contained. Don’t forget to give yourself grace in the kitchen. Prepare for a season of paper plates!! Seriously, this such an inexpensive way to create sanity during a season of transition. Another sanity-saver is to create a bottle making station which will include space in the cabinet for formula or bottles right above where you make the bottles. Better to keep it vertically aligned than have some things in the pantry, some in the laundry room, and some on the counter. Discover what it takes to make a bottle and get all those things together. Maybe it’s a Baby Brezza with the formula nearby. Maybe it’s a bottle drying rack placed strategically under the cabinet where they will be put away when dry. Think through how to place things intuitively to eliminate extra steps. You’ll be sure to want to spend those saved moments snuggling your baby. 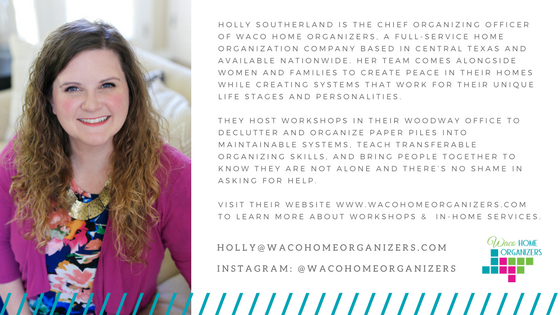 Holly Southerland is the Chief Organizing Officer of Waco Home Organizers, a full-service home organization company based in Central Texas and available nationwide. Her team comes alongside women and families to create peace in their homes while creating systems that work for their unique life stages and personalities. They host workshops in their Woodway office to declutter and organize paper piles into maintainable systems, teach transferable organizing skills, and bring people together to realize they are not alone and there’s no shame in asking for help. Visit their website at www.wacohomeorganizers.com to learn more about the workshops and in-home services. Newer PostWhat is Your Best Birth? Birth Waco serves Waco and the surrounding areas including: McLennan County, Bell County, Bosque County, Coryell County, Hill County, Johnson County, Axtell, Belton, Bosqueville, Cleburne, Clifton, Corsicana, Covington, Elm Mott, Gatesville, Glen Rose, Groesbeck, Hewitt, Hillsboro, Killeen, Lorena, McGregor, Meridian, Robinson, Stephenville, Temple, Waxahachie, Whitney, Woodway, and Valley Mills. Don't see your area listed? Just ask!